The statistics below represent the number of religious who belong to the 240 congregations, members of the CRC. These statistics have been compiled in the Fall of 2017. The CRC gathered together some provinces into regions to fulfil its mission in Canada. The statistics below represent the number of religious who belong to the 240 congregations, members of the CRC. These statistics have been compiled in the Fall of 2015 and 2016. The CRC gathered together some provinces into regions to fulfil its mission in Canada. Article by Yvon Pomerleau, OP, CRC’s Executive Director, publish in the CRC Bulletin, Volume 11, No. 2 – Spring 2014. Is it possible to paint a picture of religious life in Canada using statistics? Some figures speak for themselves. Even if they do not explain everything, we must be able to wrap our head around them. For the sake of simplicity and convenience, the statistics will be presented here in rounded numbers and percentages. Besides, precision does not necessarily coincide with accuracy, because the data changes from day to day. This table reflects data gathered back on December 31, 2012. Throughout Canada, there are a little more than 200 religious congregations, of which 185 responded to our questionnaire. 70% of congregations are female and 30% male. The same percentage applies to French-speaking congregations (70%) versus English-speaking ones (30%). 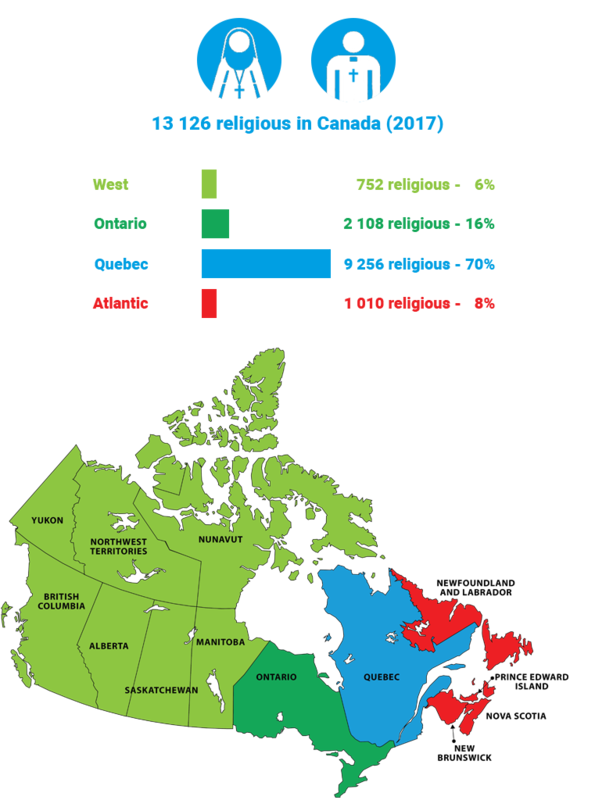 The total number of men and women religious is less than 16,000, of which 80% are women and 20% men, and again, 80% Francophone and 20% Anglophone. 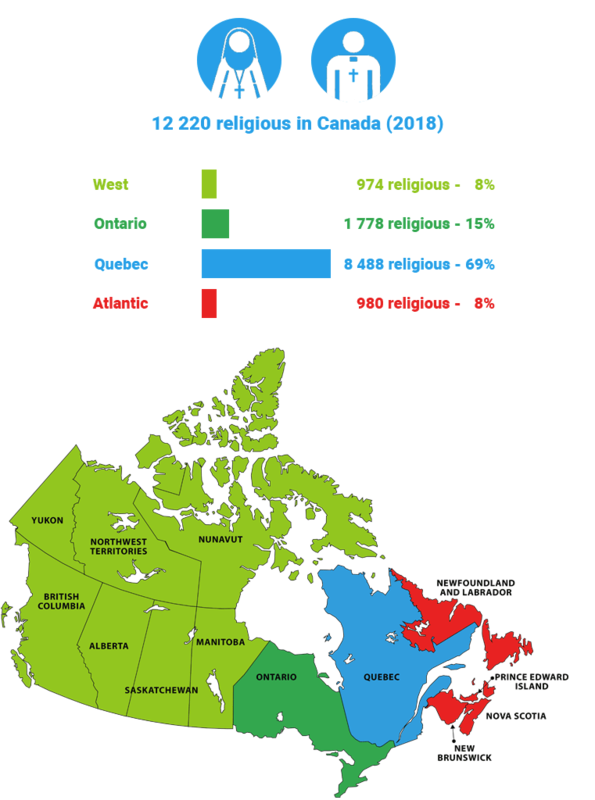 Of the men and women religious living in Canada, 90% originated in this country and 10% came from abroad. Distribution over the national territory is very uneven: 68% in Quebec; 16% in Ontario; 8% in Western Canada; 6.5% in the Atlantic and 1.5% in the Northern Territories. The breakdown by age group is as follows: 50% are over 80 years old; 44% are between 60 and 80 years old; 5% are between 40 and 60 years old and only 1% under 40. There are only 120 (1%) men and women religious in initial formation, including 40 novices across the country. However, almost 25% of religious live in a nursing home. In terms of community living, the situation is as follows: 45% live in communities of more than 20 people; 15% in communities of between 10 and 20 people; 13% between 5 and 10 and 15% less than 5 people. 8% of men and women religious live alone; 3% with other congregations and 1% with laity. The number of associates or fraternity members would be around 10,000, of which 1% are consecrated laypeople. But these figures fail to tell the whole story. They say nothing of the many social and apostolic commitments in the areas of education, health, guidance, catechesis and prayer. What cannot be measured in hard numbers is probably the most important. 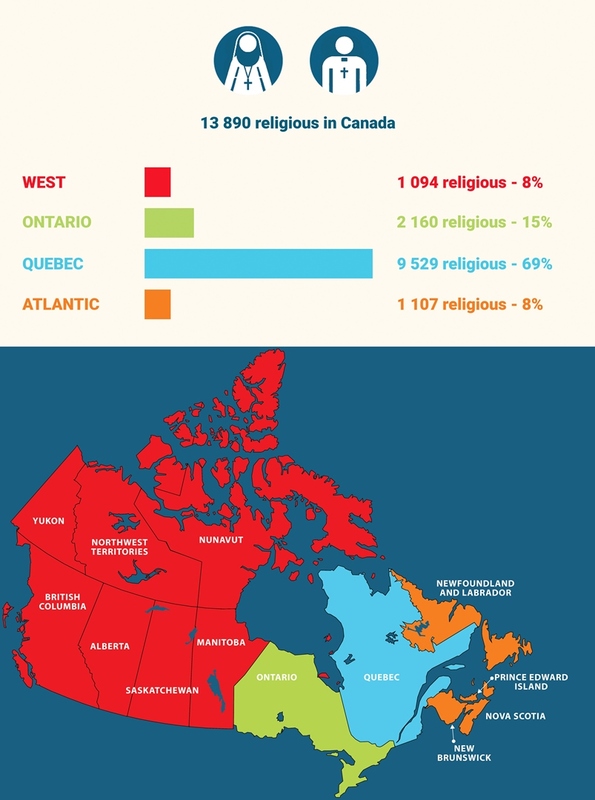 The 2011-2012 statistics gives totals per province of the number of men and women religious belonging to the 235 religious congregations, members of the CRC. In 2011, the total number of women and men religious belonging to the 235 religious congregations is: 18,098. Open this PDF document: Statistics 2011-2012. According to our latest data (December 2012), the total total number of women and men religious is now 16,900.